In the absence of hatred, one can understand the Palestinians. Without it, even some of Hamas’ demands might sound reasonable and justified. Can we possibly conduct a discussion, however brief, that is not saturated with venomous hatred? Can we let go for a moment of the dehumanization and demonization of the Palestinians and speak dispassionately of justice, leaving racism aside? It’s crucial that we give it a try. In the absence of hatred, one can understand the Palestinians. Without it, even some of Hamas’ demands might sound reasonable and justified. Such a rational discourse would lead any decent person to clear-cut conclusions. Such a revolutionary dialogue might even advance the cause of peace, if one may still dare say such things. What are we facing? A people without rights that in 1948 was dispossessed of its land and its territory, in part by its own fault. In 1967 it was again stripped of its rights and lands. Ever since it has lived under conditions experienced by few nations. The West Bank is occupied and the Gaza Strip is besieged. This nation tries to resist, with its meager powers and with methods that are sometimes murderous, as every conquered nation throughout history, including Israel, has done. It has a right to resist, it must be said. Let’s talk about Gaza. The Gaza strip is not a nest of murderers; it’s not even a nest of wasps. It is not home to incessant rampage and murder. Most of its children were not born to kill, nor do most of its mothers raise martyrs — what they want for their children is exactly what most Israeli mothers want for their own children. Its leaders are not so different from Israel’s, not in the extent of their corruption, their penchant for “luxury hotels” nor even in their allocating most of the budget to defense. Gaza is a stricken enclave, a permanent disaster zone, from 1948 to 2014, and most of its inhabitants are third- and fourth-time refugees. 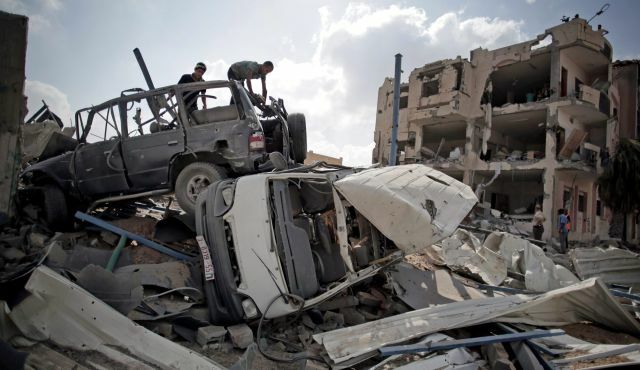 Most of the people who revile and who destroy the Gaza Strip have never been there, certainly not as civilians. For eight years I have been prevented from going there; during the preceding 20 years I visited often. I liked the Gaza Strip, as much as one can like an afflicted region. I liked its people, if I may be permitted to make a generalization. There was a spirit of almost unimaginable determination, along with an admirable resignation to its woes. In recent years Gaza has become a cage, a roofless prison surrounded by fences. Before that it was also bisected. Whether or not they are responsible for their situation, these are ill-fated people, a great many people and a great deal of misery. Despairing of the Palestinian Authority, Gazans chose Hamas in a democratic election. It’s their right to err. Afterward, when the Palestine Liberation Organization refused to hand over the reins of power, Hamas took control by force. Hamas is a national-religious movement. Anyone who champions hatred-free dialogue will notice that Hamas has changed. Anyone who manages to ignore all the adjectives that have been applied will also discern its reasonable aspirations, such as having a seaport and an airport. We must also listen to scholars who are free of hatred, such as Bar-Ilan University Mideast expert Prof. Menachem Klein, whose reading of Hamas goes against the conventional wisdom in Israel. In an interview to the business daily Calcalist last week, Klein said Hamas was founded not as a terror organization but rather as a social movement, and should be viewed as such even now. It has long since “betrayed” its charter, and conducts a lively political debate, but in the dialogue of hatred there is no one to hear it. From the perspective of the dialogue of hate, Gaza and Hamas, Palestinians and Arabs, are all the same. They all live on the shore of the same sea, and share the single goal of throwing the Jews into it. A less primitive, less brainwashed discussion would lead to different conclusions. For example, that an internationally supervised port is a legitimate and reasonable goal; that lifting the blockade on the Strip would also serve Israel; that there is no other way to stop the violent resistance; that bringing Hamas into the peace process could result in a surprising change; that the Gaza strip is populated by human beings, who want to live as human beings.